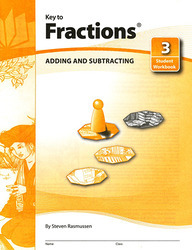 Key to Fractions covers topics from basic concepts to mixed numbers. Handwritten examples provide a non-threatening model, and exercises are structured to ensure student success. Key to Fractions works well for elementary students learning new skills as well as for older students revisiting topics.